Who knew that a basic, everyday umbrella could be more than a simple shelter from the weather? The five imaginative, fun loving characters in The Green Umbrella certainly did. Elephant is the owner of one handsome, heavy-duty hunter-green umbrella which, at the beginning of the story, is being put to use in a traditional fashion: it is raining. While out and about Elephant is approached by Hedgehog who recognizes this very same umbrella as his boat. Cat then comes along and interprets the umbrella as his tent. Bear, in turn, makes claims on the umbrella as his flying machine. Rabbit envisions the umbrella a cane. As sure as Hedgehog, Cat, Bear and Rabbit are about their own personal adventures with the umbrella, Elephant is equally adamant that the umbrella was really used as the prop that sparked his own fanciful escapades. The confident characters all seem at odds over this dilemma. There is some tension as to who’s umbrella it is. When the sun comes out, and the umbrella is folded up, instead of leaving this ownership conundrum alone and parting ways, the five-some decide to become the best of friends. They have tea together, on a hillside, reading a book, under the shade provided from the umbrella. And they plan out their future together with all the fun and frolicking the green umbrella can conjure. 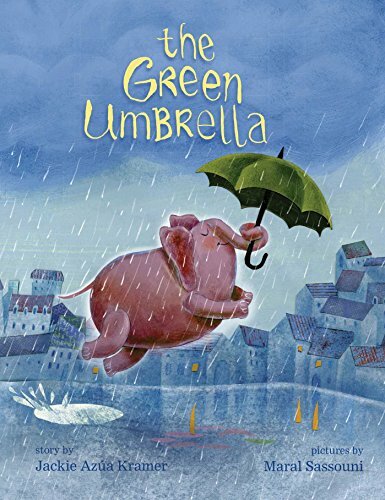 With a story that is super simple, there is not much depth or growth to any of the characters, the main attraction is indeed the curious and clever uses of the umbrella. For anyone who has ever observed a child using something . . . a box, a stick, a sock, or a whatever . . . in an imaginative fashion, this book will strike a chord. Somewhat unsettling, on the other hand, is that, on a deeper level, it is not clear what the message is. There could be more read into the story than was ever intended by the authors, mostly conveyed through the artwork. The characters seem to expect for Elephant to part with his umbrella when each of the claims of ownership are presented. There is little bit of awkwardness in the expressions and body language of Bear, Cat, and Hedgehog. Elephant graciously acquiesces to share his possession and, one hopes, not out of guilty manipulation, but out of true joy and friendship. Sassouni’s illustrations are sweet. She has given life and personality to each little critter and backed them up with an inviting landscape; however, the choices of alternating between full pages and partial page vignettes; character flash-back scenes and current happenings; full color palettes and a singular random use of muted sepia tones, creates a flow that is somewhat tricky to navigate and feels unbalanced. From a preschool perspective, the young readers may not even notice any of the design choices and will quickly indulge in the light heartedness of it all.